When I built the cedar box for the asparagus, I pictured it full of fern-y plants, separating the pool from the driveway. 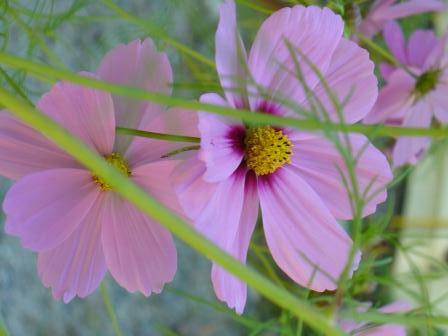 I put some regular cosmos and some dwarf cosmos in with the asparagus, and waited. Well, the pool is gone, but check out the flowers! 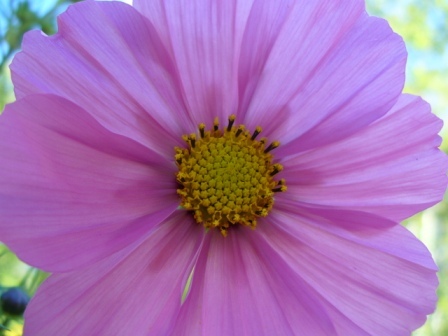 Author salpal1Posted on September 27, 2013 Categories how it came outTags cosmos, garden4 Comments on Cosmos! Do you remember last spring when I got two plain vanilla colored skeins of Spud and Chloe delicious silk/wool sock yarn, and decided to experiment with crock pot and Kool-Aid? 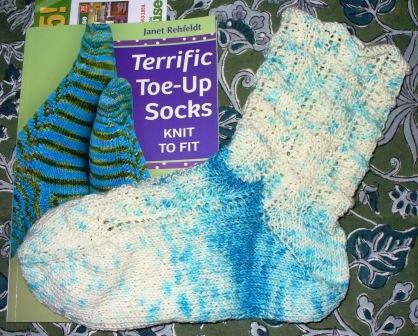 I knit a pair of toe up socks with the resulting blue and white yarn. I had a lot left over, and didn’t really want to knit something to match the socks. And there was a lot of white space left on the yarn. So, I thought I would try over dying. I used green and purple, and this is the result. I wasn’t sure how I liked it, but I knit it up anyway, and this is how it looks now. I really like how it is so different from one end to the other – almost like a scarf that moves through the four seasons. Of course, it is in colors that I don’t really wear, and which no way will match my sapphire blue winter jacket, so it goes into the give-away bag. But it was lots of fun to experiment with dying! 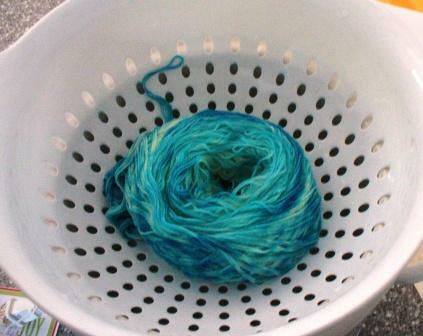 For all of this dying, I wound the yarn into cakes, so the absorption would vary from the outside to the inside. 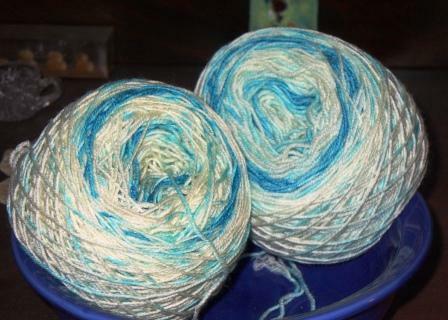 Since then, I have done more Kool-Aid dying, using a less fine yarn, some 100% wool worsted weight I have in the stash. I’ll be posting more photos of things I make with that as well. This week I have a mixed up list. I have an appointment with the doctor at 11 to get three more spots taken off my back. Not looking forward to all those Novocaine shots, that is for sure. I also have more yard work to do, as of course, I did not finish it all last weekend. I have never finished it all, I do not think it is possible. Although the pool is gone, the ladder, floats, etc. have to be put away, so that is easy and maybe I will do it. 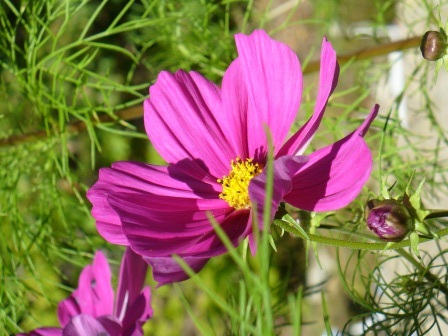 I want to get some good photos of the cosmos blooming in among the asparagus, so I can share it with you, it looks just like I imagined! How often does THAT happen? There are the usual household chores: laundry, grocery shopping, the Post Office. I have some new knitting and crafting going on, I want to share that with you as well, so more photography should happen. I might get up to Hobby Lobby, they are celebrating their grand opening today. I invited my sister in law, S, to join me, and she said she can’t go, but is surprised that I am, because of their politics. So now I am wondering – what politics? Does anyone know anything about them? Not sure what else I will feel up to – or even if I feel up to all that shopping, etc., but I will give it my best shot! I took a look at what was on the camera that you might be interested in. 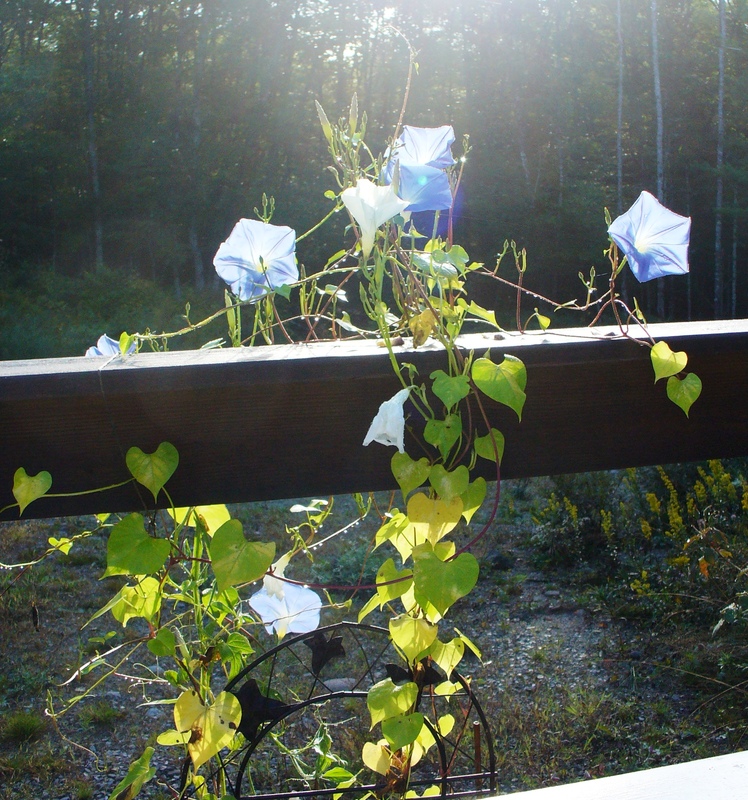 To start, here are my morning glories – blooming at last. I tried to get a shot of them with the sun behind, as they were literally glowing, but of course, the glare was a bit pronounced. 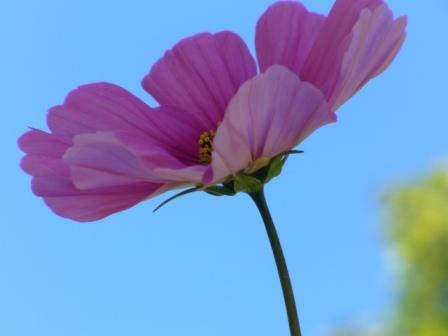 Not sure why they wait until the last-minute to bloom, when the plants are nearly done, but so be it. 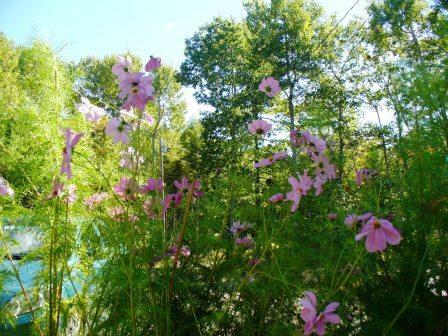 They are lovely and green all summer, then they start to die back, and bloom like crazy in the process. Last Friday while I was NOT going to the fair, I did go to a local institution that I have never been to before. It is called H.O.M.E. (I haven’t a clue what that stands for), and is a whole community designed to provide employment and shelter for homeless people in our community. I had heard that they had a great shop where all the artisans sold their work, and I finally (8 years later) got a chance to stop in and check it out. Some of it was what you would expect – crocheted toilet paper covers and the like, but they had a lot of nicer crocheted and knitted things, lots of quilts, pottery, jewelry, leather goods. A wide array, and some of it really well done. Almost all of it priced way too low, of course, but that is a topic for another post. I did manage to find a few nice things – the pot holders are for a Christmas present, and were a ridiculous deal. The coasters are for us, and they are great! They are double – the center is two coasters joined together by the trim. Really well done, and nice. And – wait for it – $3.75 for 4. Absolutely ridiculous. I asked at woman who works there if they accept donated things to sell, and she said no, it is consignment, the creators do get some of the money. 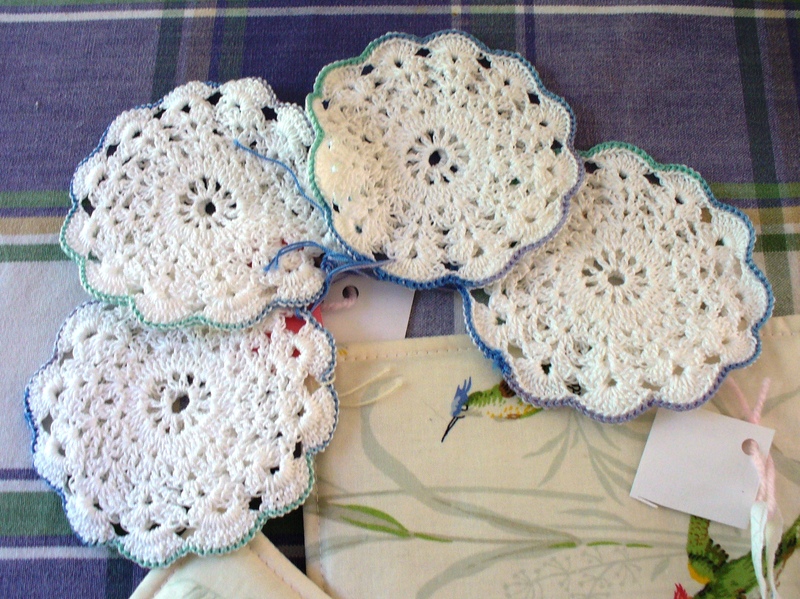 So this lady, God bless her, is sitting making these really nice coasters and probably not earning enough on them to pay for the thread. WHY? Last thing on the camera is a picture of this hurricane hat – which I learned about through my WordPress reader, but I can’t for the life of me remember which of you posted about it. If you tell me, I will give you lots of credit, because I like this pattern. 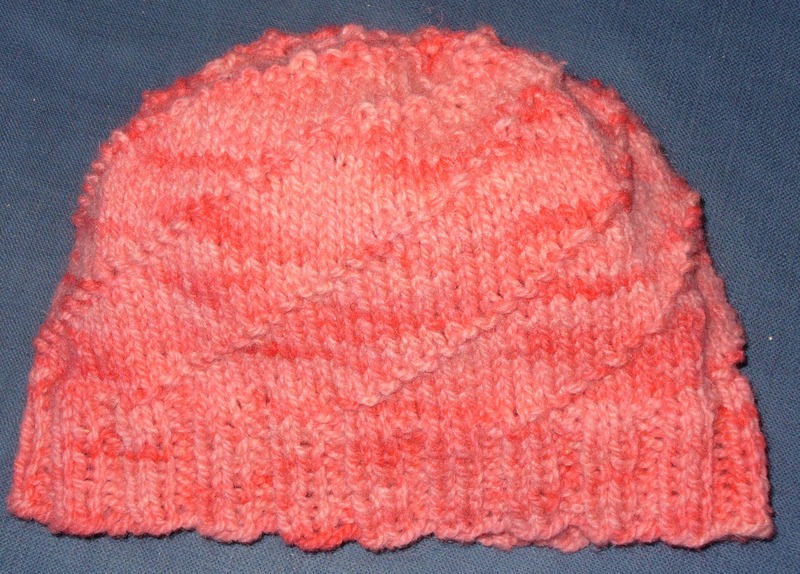 I modified it slightly – I am testing a ponytail hat, and so I added a slit just below the change from ribbing to pattern. I liked it, but my teenaged tester thought the slit was too low, and I should raise it up about three inches. I will, and will keep trying until I get that right, then tell you how I did . (Hint: It ain’t rocket science). I will also modify the basic hurricane hat pattern though – to a cyclone pattern? Anyway, the current pattern calls for you to knit 9, purl 1, on an odd number of stitches, so the purl moves over one each row. I found it annoying to have to count, and to have to purl right BEFORE the purl on the last row. So, instead of ADDING a stitch when I finish the ribbing, I am going to DECREASE a stitch. Then, I will purl the stitch right AFTER the one in the row below, so no counting! The swirl will go the other way, hence the change in name. I will also have to change the decreases a bit, to do them right after the purl instead of before, and I may have to lean them the other way, I will let you know what I figure out. The other fun thing about this hat is that this is yarn I dyed using tropical punch Kool-Aid and a few drops of red food coloring. In the crock pot, with about 6 cups of water and 6 caps of white vinegar. I left the wool in a hank, did not wind it in a ball, and it came out nice and heathery. 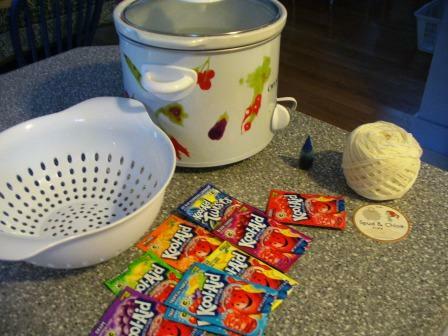 So this weekend, I played with more Kool-Aid and yarn, wait until I get photos of that experiment! That’s all that is on the camera at this time – thanks for slogging through this post of very random things I am thinking and doing! When I went to the Post office yesterday, I was so pleased to find a package from the UK! I knew I had won a skein of Noro from Claire over at http://mollieandclaire.wordpress.com/, but of course, she tucked a few wee treasures in the package as well. 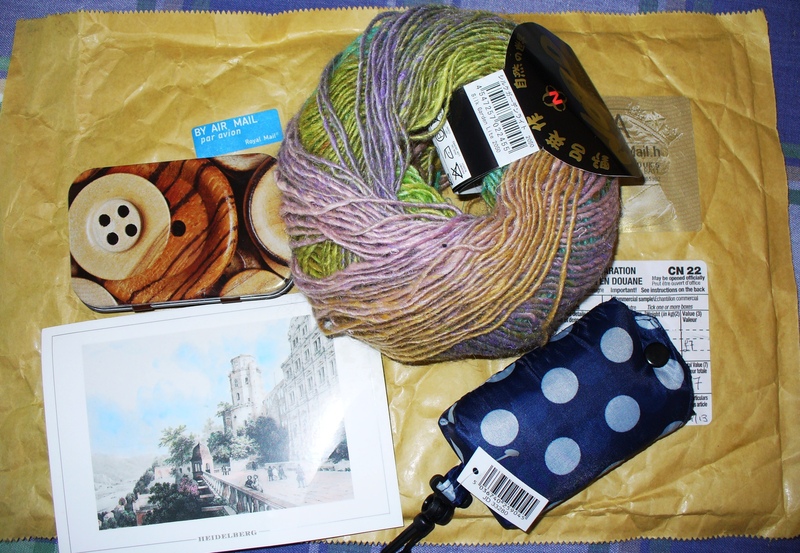 Thanks so much, Claire – I, too, love that colorway, and can’t wait to use it. I am already using the tin to hold some beads as I string them on yarn to make a beaded scarf. And I will keep the pouch handy for unexpected yarn purchases – great idea! Thank you so much for sending all this goodness. Author salpal1Posted on September 21, 2013 Categories what I am thinking aboutTags give away, prize, thank you, yarn11 Comments on Check it out! 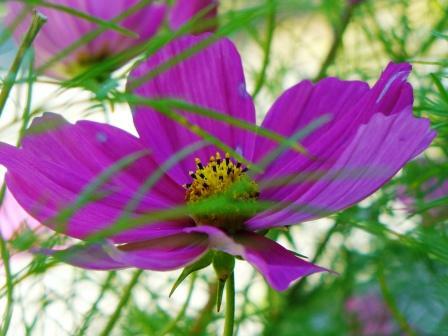 -start putting the gardens to bed, clearing out annuals, etc. 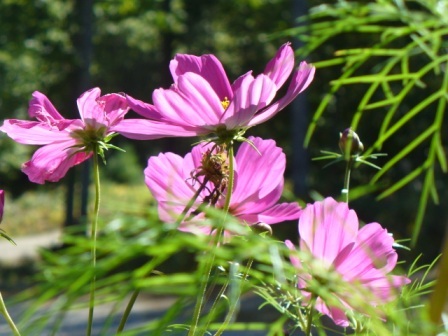 -Do a little more pruning on the bank, and maybe pull some crabgrass out of the garden and then move daylilies from the bank to the garden – follow that? -I might call my sweet sister and see how we can get that last skein of Quince and Co yarn to me, as I ran out last night, and I want to finish the shawl, so I can start wearing it. It is getting cool! and write some email correspondence I have been putting off. But I probably will continue to put that off. -also, get photos off camera so I can share them with you, I think I have some beauties. Or potential beauties when I crop out the strange things that appear in my photos. -Work on the mystery knitting project so I can share it with you. -Another thing I know I will do is finish up Aunt Nan’s birthday card and mail it off. It will be last as Friday is her birthday. Oops. -And I will weigh in for the Biggest Loser. Yep, we are starting that again this week. We have eaten plenty in preparation for it, I must say. Might just defeat the purpose, right? You can see how much fun I will have if I don’t go to the fair. Crimson Crow, PLEASE call me. Save me from this drudgery. 🙂 Are any readers out there near enough to Maine that you would like to experience the great Maine organic rural living agriculture extravaganza known as the Common Ground Fair with me? Leave a comment, we can make it work. Getting my brain back on track this week! Yesterday was the first day back in the office in 2 weeks, and in some ways, it felt like I never left. Got a big pile of work to get through, surprise, surprise. Got the unofficial word that we got another grant I wrote, though. Pretty amazing if it is true, as it was a tough one, very competitive. So that was super news. The Pi shawl – I made excellent progress last week in Phoenix. And I don’t have enough yarn. 😦 I thought I did, and that I had figured it rightly. I went with only 30 rows in the last section, and the garter stitch edge. 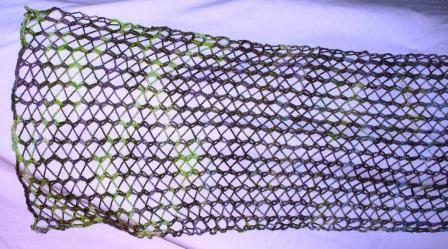 I would have done better to keep knitting around and then done the crochet edge that EZ said was adequate. 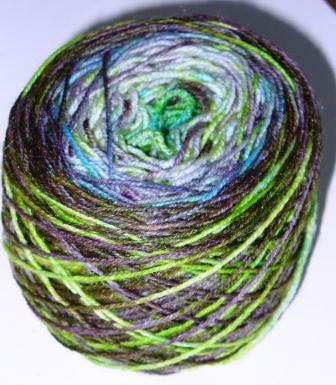 But, since I didn’t, I will have to ask my sister to go get me one more skein. 😦 If you want to do Pi with Quince and Co Finch, I suggest at least seven skeins. Using US size 8 needles, I started with 5, and will need 6 to complete it, and I know it would be a bit nicer if it was a bit wider. That being said – I highly recommend this yarn for this project – it is just yummy. 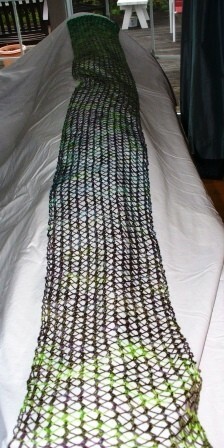 Spun tightly and round, very stretchy (which may save this project in the blocking) all wool but far from scratchy. Nice body to it. I can’t wait to wrap it around me. A, L and I did the AIDS walk in Bar Harbor Saturday – I was exhausted, so we did not hang around for the festivities, but it was a beautiful day for a stroll around Bar Harbor. Only the “newlywed and nearly dead” left for tourists, much more manageable! We finished the license plate game for the 3rd time this summer, when we spotted a Louisiana plate down by the harbor. We even have a spare Hawaii to start next year. That means that we have set a record – between Memorial Day and Columbus Day, we have seen cars from every state at least three times. Usually it is a struggle to get this done twice. A sign of a better economy? Sunday was a lay-low day for me – I worked on putting the pool away and did laundry and knit. The pool is a SAD TALE. When I popped open the plug to let the air out of the rim, the plug pulled out in my hand. That finishes off the pool. So instead of clearing it up and putting it away, we will haul it to the dump next weekend when we have the truck again. Next spring we will get a new one, slightly different style, I think. I’d like one I don’t have to work so hard to set up and take down. But still small. I don’t need a big family sized one, just something to get in and cool down, relax. So I will be doing some research this winter. Last night, I went to Bangor and met A. We had planned a trip to Hobby Lobby and then supper at the Olive Garden, but Hobby Lobby still isn’t open. It should open on the 27th, so we will go next month. I look forward to seeing what it is all about. Supper at Olive Garden was good as always, and the leftovers will be good tonight. I think that is it, for what I have been doing since I got home.